Introducing the new Fisher Investment Series, comprised of engaging and informative titles written by renowned money manager and bestselling author Ken Fisher. This series offers essential insights into the worlds of investing and finance. Over the course of nearly two centuries, the innovations, mistakes, and scandals of different market participants have played an important role in shaping today's financial markets. 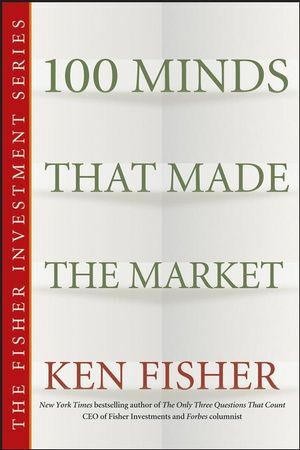 Now, in 100 Minds That Made the Market, Ken Fisher delivers cameo biographies of these pioneers of American financial history. From Joe Kennedy's "sexcapades" to Jesse Livermore's suicide, this book details the drama, the dirt, and the financial principles of an amazingly inventive group of financial minds. Fisher digs deep to uncover the careers, personal lives, and contributions of these individuals, and leads you through the lessons that can be learned from each one. Here you have 100 of the best teachers -- some you already know, some you will feel you know, and some you may not have previously discovered -- whose experiences will undoubtedly enhance your understanding of the markets. With a few pages dedicated to each person, 100 Minds That Made the Market quickly captures the essence of the people and ideas that have influenced the evolution of the financial industry. Ken Fisher is best known for his prestigious "Portfolio Strategy" column in Forbes magazine, where his twenty-three-year tenure of high-profile calls makes him the fourth longest-running columnist in Forbes' ninety-year history. Ken is the founder, Chairman, and CEO of Fisher Investments, a multi-product money management firm with over $40 billion under management. His success has ranked him #297 on the 2006 Forbes 400 list of richest Americans. He is a regular in the media and has appeared in most major American finance or business periodicals. Fisher also recently authored the New York Times bestseller The Only Three Questions That Count, also published by Wiley. JOHN PIERPONT “JACK” MORGAN, JR.